Simply designed and simple to use, the GRO Wedge from GRO Products is an elevated planter that keeps flowers, herbs, and vegetables easily accessible. Ideal for small spaces like patios, decks, condos, apartments, assisted living facilities, or any smaller space where you’d like a contained garden, the handicap accessible GRO Wedge is also perfect for those who don’t want to or can’t bend over to garden. The compact 16-inch tall GRO Wedge can also help to prevent pets and other critters from damaging your plants and seedlings. 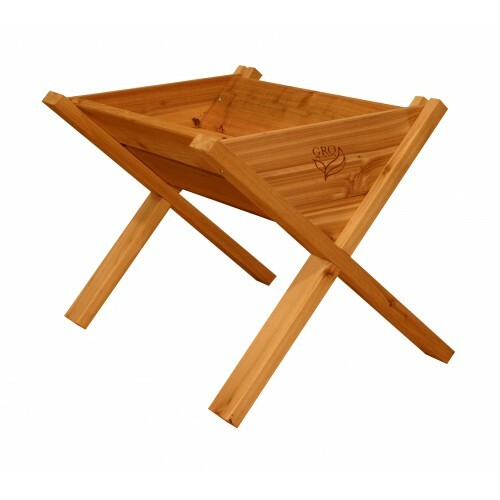 This model has a footprint measures 16″ W x 24″ L. It’s constructed with unfinished cedar, a naturally rot and insect resistant material Easy to assemble, the pre-cut GRO Wedge comes pre-drilled and pre-cut with all fastening hardware included. A family owned and operated business, GRO Products manufactures all its quality products in the USA, including elevated garden planters and its versatile Vertical Gro System (VGS).